I know it’s been a hard week with the Saints losing last Thursday to the very annoying Dallas Cowboys in a game that many boasted was going to be a wipeout. The Black and Gold went into the contest with all the swagger that the Apollo Creed went into his match with Ivan Drago. All that was missing was Michael Thomas dancing on to the blue star midfield in Carl Weathers’s sequined Uncle Sam get up. But when time expired it was the Saints lying prone on the mat with the Black and Gold faithful looking like Mrs. Creed. Aside from the Saints’ sack happy defense, the loss at Jerry World advertised that the Drew Brees offense can be held in check. Yes the officiating was bad, but the referee non-calls could’ve been overcome by not dropping the football. That loss is squarely on the offense’s shoulder pads and Coach Sean Payton’s windbreaker. But be of good cheer Who Dat Nation, for Week 13 was not a total loss. Carolina Panthers quarterback Cam Newton’s fist full of interceptions helped continue his team’s death spiral while New York Giants and ex-LSU wideout Odell Beckham, Jr .touchdown passed his way towards a major upset over the Monsters of the Midway. 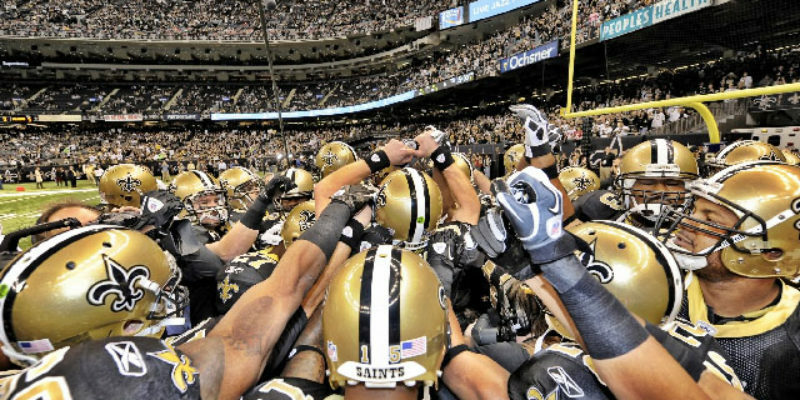 Collectively the other games helped tow the Saints another mile marker to claiming their division and scoring a first round bye. As of right now Payton’s team can ice the division by winning (or tying) at Tampa Bay on Sunday or with yet another Carolina non-win. With a magic number of 1 for the division, there’s a better chance that the preprinted Saints NFC South champion t-shirts will be on the racks of the Black & Gold store on Vets than in a relief clothing shipment to whatever Third World country that received the Falcons Super Bowl stuff two years ago. While all eyes are locked on Atlanta (the Super Bowl host city, not the team), claiming the division is nothing to dismiss at as it would mark the first time the Saints won the NFC South in back-to-back years. The next goal for the Saints would be scoring what would be their third first-round playoff bye in franchise history. As of now this team is the second seed, trailing the Los Angeles Rams by a game (technically one-half game because we have the tie-breaker). The Cowboys hold the tie-breaker over the Saints though New Orleans leads Dallas by 2.5 games with 4 left to play. If the Saints win 2 more games or if the Cowboys drop 2 or if the Saints win one game and the Cowboys lose a game, the Cowboys cannot overtake the Saints for the first round bye. A Saints win and a Cowboys tie would have the same result, sending Dallas to the Wild Card playoff round. The greater threat to the Saints grabbing a first round pass are the Chicago Bears. Thanks to an upset win by the Giants, the Bears remain two games behind the Saints. A Saints win on Sunday coupled with a Bears loss means that the Saints can’t do any worse than ending up with the same record. And that’s where things could get complicated as conference record would be the next determining factor in seeding as the Saints and Bears didn’t play against each other in the 2018 regular season. Those two games against the Carolina Panthers could become extremely important for all parties, since the Cats could be fighting for a Wild Card spot. However any combination of three Saints wins/Bears losses could make the last game if not two games of the season moot. At least for New Orleans. Either way the Black and Gold are better off not having to go to Chicago in January. You don’t want to go there. Trust me. Yet there would be a major upside to a Chicago win as it would come at the expense of the Rams. Wins by the Bears and Saints puts the Black and Gold back in the top spot of the NFC and masters of their own playoff destiny. As this is likely the last tough game on the Rams’ schedule, Brees and company would have to run the table, playing the starters until the clock runs out in the season finale against the Panthers in the Superdome. Though that opens up the Saints star players to injury, it would also afford Drew Brees an opportunity to get back into the MVP conversation. The Black and Gold travel to Tampa this Sunday taking on the schizoid Buccaneers and their rotating quarterbacks as the Fitzmagic has left the playing field. Superstitious Who Dats have pointed out the similarities between the 2009 and 2018 seasons, including disappointing losses to the Cowboys and the Buccaneers. Hopefully Buccaneers quarterback Jameis Winston will be eating crab legs and not a “W” come Sunday evening.